Students for Justice in Palestine members present their appeal during the SUA meeting on Nov. 10. Photo by Ali Enright. During the Student Union Assembly’s (SUA) last meeting, Students for Justice in Palestine (SJP) representatives presented its appeal of former SUA Chair Shaz Umer’s controversial decision to nullify a divestment resolution passed in May 2014. 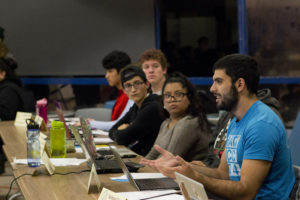 Within minutes of the meeting’s start, appointed Porter College representative Eli Guzman-Martin motioned to add SJP’s appeal to the agenda, allowing SJP representatives to propose the first-ever SUA appeal of a chair’s decision of this magnitude. The appeal was tabled to next week’s meeting, where the assembly will vote on whether to rule Umer’s decision as unconstitutional and if the resolution will take affect. The University Socially Responsible Investment Resolution (USRIR) calls for the UC to divest from companies “complicit in the severe violation of Palestinian human rights,” according to SJP’s appeal. USRIR advocates for divestment from Caterpillar, Hewlett-Packard, Lockheed Martin, General Electric and Elbit Systems, companies that “profit from the Israeli occupation of the West Bank, East Jerusalem, and blockade of the Gaza Strip,” according to the resolution. When SUA representatives asked questions about the divestment resolution’s language on Nov. 10, SJP representatives emphasized the focus should be on due process and the legality of Umer’s decision — not the divestment and whether it should be passed. SJP member and graduate student Boian Boianov said the appeal shouldn’t be “hugely uncontroversial,” given the technical scope of discussion and that the resolution was approved by the majority of SUA representatives two years ago. After the first vote during the May 27, 2014 SUA meeting — which didn’t end until 3 a.m. — the resolution was one vote shy of meeting the required two-third majority. A member then motioned to suspend the bylaw, lowering approval to a simple majority. The motion to lower the threshold passed by exactly a two-thirds majority, allowing the resolution to be voted on again. The resolution, only needing a simple majority in the second vote, passed 22-14-1. Representative Simba Khadder vocalized his opinions following SJP’s proposed appeal of a past chair’s decision. Photo by Ali Enright. 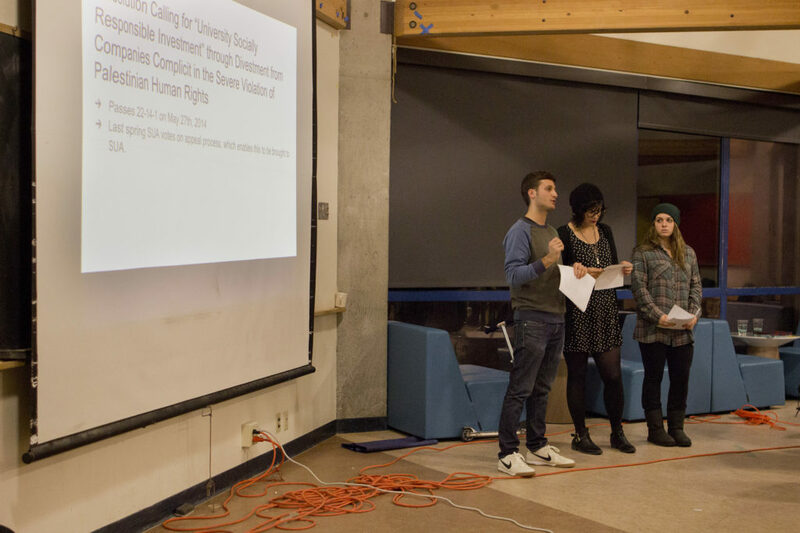 Two days after the resolution supposedly passed, Umer decided to review USRIR and the bylaw’s suspension following objection largely from pro-Israel student groups. This review carried on for 17 days, and three weeks later on June 17, 2014, Umer ruled that the incorrect bylaw had been suspended, rendering the resolution’s passage invalid. Several phone calls from City on a Hill Press to Umer after Tuesday night’s meeting were unanswered by Wednesday night’s press time. Boianov said even though the video of the meeting in 2014 isn’t 100 percent clear on what exact bylaw was said, the SUA representatives were all understanding of the bylaw intentioned to be voted upon, and therefore the vote should stand. Jewish Student Union (JSU) Vice President Daniel Bernstein was JSU’s President in 2014 during the original vote, and is currently the elected Stevenson SUA representative. He said Umer made the correct conclusion that the resolution was illegitimately passed. “To go back and appeal something, especially when people who were there and agreed on the dismissal of it are no longer here, and trying to appeal something when there’s a completely different student body is almost doing a complete disservice to previous SUAs,” Bernstein said. He wasn’t in attendance at the last SUA last meeting. SJP was unable to appeal the decision last year because there was no process to appeal chair’s decisions in SUA’s bylaws. SJP representatives worked with SUA officers to add appeal language to the bylaws, which were passed last spring. Bernstein said if he was at the meeting he would have advocated for the appeal proposal to be tabled for two weeks instead of one, to allow for more conversation among college senates and student organizations. He criticized SJP’s unwillingness to discuss the divestment and sole focus on Umer’s actions. SJP representatives at the SUA meeting handed all representatives copies of previous statements from students advocating for Palestinian human rights, along with letters of support from former SUA representatives Ivan Medina and Angelica Montes, who voted to pass the University Socially Responsible Investment Resolution (USRIR) in 2014. Medina and Montes wrote that Umer’s decision was illegitimate and should be overturned. SUA will meet next on Nov. 17 at 8 p.m. at the Oakes Learning Center, where representatives will vote on SJP’s appeal.